Bronson was named after S.P. Bronson’s father and was originally known as “Chunky Pond.” The original settlement was founded off of Main Street and was a saw mill and trading post. 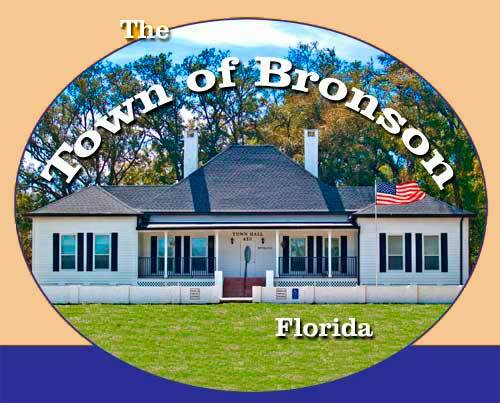 The Town of Bronson is the county seat and known as the “Heart of Levy County.” The Property Appraiser’s office and Tax Collector’s offices are all located in the Levy County Courthouse. Its scenic beauty, wildlife and outdoor recreational opportunities make Levy County the perfect destination. With nearly one fifth of the county set aside for state and national wildlife areas, Levy is blessed with numerous parks, preserves, springs and wildlife refuges where visitors can discover rest and recreation in abundance. In fact, there are over 25 nature-based recreational sites in Levy. The historic Lower Suwannee River borders the county’s north end, while the meandering Withlacoochee winds through the southern part. Thanks to its unique location, Levy County has the distinction of a wide variety of environments, from dense hardwood forests and marsh lands to sand hills and Gulf Coast waters. Florida boasts one of the largest concentrations of freshwater springs in the world — almost 400 total — and remarkably, nearly 200 of those are located within the Suwannee Basin. There are 18 “first-magnitude” springs in North Florida, so classified because they discharge 100 cubic feet of water per second. That’s a mind-boggling 64 million or more gallons of water per day! No wonder Levy County’s numerous springs are one of its most popular destinations for both serious scuba divers and those who just want to swim or snorkel in the crystal clear waters.